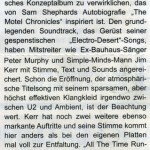 Eclipsed Magazine, Germany. Loving the Eno/Lanois/Cash comparison. Basically, one has I already do not feel like 1, an album more hear when behind each item with the stupid word “featuring” a guest post angekündigt is because it is often only the usual tribute stuff follows. And first in the moments one feels here a bit like in the shallow Radio landscape in which PetitessenPop a la Marit Larsen duration whispers. But after a few unfolds Stucken The debut of one The Dark Flowers subtle, sinister magic. 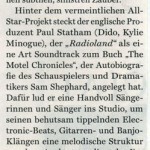 Behind the alleged all-star project puts the English producer Paul Statham (Dido, Kylie Minogue), the “radio land” as a soundtrack to the book “The Motel Chronicles “,the autobiography of the actor and playwright Sam Shephard. With it, he invited a handful of singers into the studio to his carefully tramping electronic beats, guitars and banjo sounds a melodic structure to give. Best manage the Jim Kerr of Simple Minds, the force his sonorous voice to the otherwise rather sallow Stucken one be easily recognisable gives. Some songs are however especially beguiling in its simplicity, about which of Shelly Poole infinitely delicate singing “All The Time Running”. 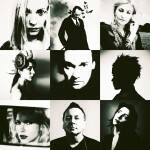 Or if Catherine AD in “Aim For The Heart” balances between Beth Gibbons and Polly Jean Harvey.